Are you searching for a new primary care doctor? The team at Medics USA is here to help. At Medics USA, we know how hard it can be to find a primary care physician. Whether you’re in need of an annual physical exam or you need to get up to date with your immunizations, our team of experts would be glad to lend a helping hand. Our patients always come first, so if you’re in need of a new clinic to visit in Virginia or Washington, DC, we’d love to see you! Our team is made up of family practitioners, internists, surgeons, and emergency medical specialists. In other words, no matter what type of care you need, Medics USA is here to take great care of you. PLUS, all our primary care patients can help manage their own healthcare through our Patient Portal. This easy-to-use, confidential online tool allows you to view lab results, make appointments, and directly email your provider. More information on the Portal can be found here. 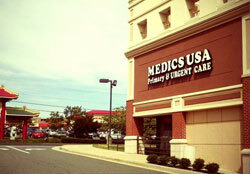 Medics USA is accepting new patients at all of our offices. We want to become the primary care provider for your whole family – from kids to seniors. Our five primary care and urgent care centers are conveniently located throughout Washington DC and Northern Virginia, most with evening and weekend hours. Find an office near you. Do you want to become a Medics USA patient? Make your first visit quicker by filling out our New Patient Forms prior to your first appointment. Complete the forms and bring them with you to your primary care visit. You can also download and fill out the forms for school physicals, sports physicals, and immigration physicals. All the forms are here. If you don’t have insurance and are paying for healthcare yourself, then you may qualify for Medics USA’s Community Care Program, which offers deep discounts on many procedures. For more information on the Community Care Program, go here.